Made out of High QUalityFood Grade Polypropylene. Size: 32pcs. , 64 pcs, 18pcs, 24pcs, 9pcs. Products are FDA approved, Food grade, BPA Free, Microwave safe, Refrigerator safe, Dishwasher safe. An elegant server with cover to keep your delicious meala warm and inviting. Planning to invite your friend for dinner! 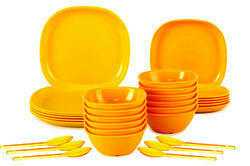 Enjoy your meal in this Plain Plastic Dinner Set, it will leave a great impression on your friends. We have a large range of Dinner set. 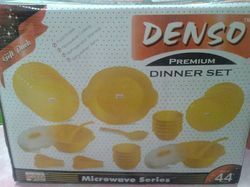 - 39 Pcs Dinner Set . Golden Wave is a scroll motif that is interpreted as waves. Washing against the rim of the plate, the golden waves create a bold yet elegant presentation. Golden Wave coordinates with the entire Platinum & Golden Wave collection.